SAY Ahh ACT ON MOUTH HEALTH. On 20th of March every year, World Oral Health Day is celebrated around the world to highlight the importance of oral health for a healthy body and to motivate people to take charge and protect their dental and oral health. World Oral Health Day helps spread messages about good oral hygiene practices to adults and children alike and demonstrates the importance of optimal oral health in maintaining general health and well-being. You can’t be healthy without good oral health – it’s one of the main pillars of general health and well-being. Oral health is multi-faceted and includes the ability to speak, smile, smell, taste, chew, swallow and can communicate a range of emotions through facial expressions with confidence and without pain or discomfort. Each year, World Oral Health Day focuses on a specific theme and reaches out to the public, oral health professionals, and policymakers, who all have a role to play in helping reduce the burden of oral disease. Oral diseases include tooth decay, gum disease and oral cancer. These are the most common and preventable noncommunicable diseases (NCDs) afflicting humankind. Staggeringly, more than half of the world’s population (3.5 billion people) suffer from untreated oral diseases. Worryingly, untreated oral diseases have increased by 40% since 1990 and with no improvement over the last 29 years, they will continue to rise unless individuals and policymakers take action now. Non-communicable diseases such as cancer, obesity, diabetes, cardiovascular diseases and respiratory diseases are closely linked to oral diseases and share modifiable risk (i.e. lifestyle) factors. These common lifestyle factors include unhealthy and high-sugar diets, tobacco use and alcohol consumption, as well as the same social determinants. The social determinants of health are the environments in the places where people live, learn, work, play and worship that affect a wide range of health risks and health outcomes. The social determinants of oral health include social, economic and physical conditions. Sugar consumption is fuelling the obesity epidemic and is also the primary cause of tooth decay, particularly among children and adolescents. Out of all human diseases, tooth decay is the most common chronic childhood disease that affects up to 90% of school-age children worldwide. This is particularly disturbing because tooth decay is largely preventable. The World Health Organization (WHO) recommends that adults limit their sugar intake to 6 teaspoons and children to 3 teaspoons per day. A regular 330 ml soft drink/soda contains almost 9 teaspoons of sugar, equivalent to 1.5x or 150% of the adult daily sugar allowance and 3 times the daily sugar allowance for children. According to the WHO, taxing sugar-sweetened beverages can lower consumption and reduce obesity, type 2 diabetes and tooth decay. The WHO also states that a tax on sugary drinks that leads to at least a 20% increase in the retail price of sugary drinks can result In an equal reduction in the consumption of sugary drinks. Also avoid consuming excessive amounts of sugar from snacks, processed food (this excludes sugars naturally present in whole fruits and milk). To encourage this recommendation, we can all work together with schools to implement ‘water-only’ policies for drinks, ban unhealthy snacks and ensure healthy food is available on school grounds. Food labelling with easy to understand sugar icons and restricting the marketing and availability of sugar-rich foods and sugary drinks will also assist in the reduction of processed sugar consumption. We now know that oral diseases, such as tooth decay and gum disease, are widespread and yet preventable. Through proper self-care, regular dental check-ups and managing risk factors, good oral health and general health can be secured. Brush your teeth for two minutes twice daily with a soft toothbrush and fluoride toothpaste to help reduce your risk of tooth decay and gum disease. Brush in a circular motion with either a SOFT manual or SOFT electric toothbrush. often to the mouth and teeth, and can cause dental decay due to the acidity and high sugar content of many alcoholic drinks. To protect your teeth and mouth whenever you play a sport that involves physical contact, moving objects or regular falls and blows wear a professionally-made mouthguard. A mouthguard is a rubber-like cover which fits exactly over the teeth and gums, cushioning and protecting them from fracture, displacement or loss. Speak to your dentist or primary healthcare provider for guidance on whether you need a mouthguard depending on the sport you play. Visit your dentist regularly for check-ups and cleanings. They can also advise on how regularly you need to book an appointment, depending on your specific needs. Just like other major diseases, prevention, early detection and treatment are key to ensuring the best outcomes and reducing the risk for oral diseases and associated health complications. This years World Oral Health Day theme is ACT ON MOUTH HEALTH. As there can be no health without oral health, that means if you Act on Mouth Health it will protect your mouth and it will also have a positive impact on your general health and well-being. On April 22nd, Shenzhen HarMoniCare Women &Children’s Hospital, the first international hospital with JCI in Shenzhen, cooperates with more than 50 insurance companies, together with ICBC-AXA LIFE and HiredChina.com held the International Insurance Seminar for expats in China. Michael from ICBC-AXA LIFE shared the direct billing services and international insurance options for expats in Shenzhen.Dr. Mark from HarMoniCare stated the common pediatric diseases in Summer and ways to prevent. Many thanks to Indian Spice for the free snacks, Samy from India and Zoe from AIA were lucky enough to win the check-up vouchers for women and children valued at 1786RMB and 1380RMB respectively. On March 11st，The Lamaze International World Open Tour Shenzhen Station was successfully concluded in Intercontinental OCT. It is the first time that Dr. Jeannette. T. Crenshaw, the former president of Lamaze International come to Shenzhen to share the healthy birth practices with more than 250 families through the courtesy of Shenzhen HarMoniCare Women & Children’s Hospital. Meanwhile, HarMoniCare was accredited as the first training base for Lamaze International in Shenzhen, which will greatly further improve the technique of natural birth in south China. Last year has come to an end ,thank you for all the support and trust you have given us during the year. We are looking forward to a year that brings new challenges and opportunities . Based on the national holiday plan ,the working hours in Shenzhen HarMoniCare Women& Children’s Hospital will be as follows. Pediatrics Department,Internal Medicine,Obstetrics (OB)Department,Gynecology Department,Clinical Laboratory,Ultrasonography Department,Pharmacy etc.For more information ,please contact our International Department Team . Kindly arrange your time accordingly,sorry for any inconvenience caused.Wish everyone the the best of luck in 2018 and a happy new year ahead ! In a big city like Shenzhen, it is noticeable that many fads come and go rather like in the food, shared bike or even hotel industry. Some trends stay for good, whilst the next best thing is slowly replacing others. One trend, however, that seems to be developing very well in Shenzhen is the fitness trend. With a growing awareness of staying fit and living a healthy lifestyle in such a work driven city like Shenzhen, sometimes the biggest frustration can be the lack of time to really focus on a dedicated daily routine. For professionals, staying fit is definitely something that’s needed but not always a possibility due to time constraints. Furthermore, if your really trying to exercise and see fast results – it takes even more dedication than usual to get the figure you’re trying to achieve which many don’t have the time to give. This is because normal exercise will typically burn fat that the body can easily access, not necessarily fat that you want to focus on removing. For this reason, many people will diet and/or exercise and find that the weight they are losing is coming off other areas of their body such as their arms but not the areas that count such as their stomach or hips. I know for me personally, this was an issue I had quite a bit when I was trying to lose weight myself. I didn’t have a lot of time to focus on exercise but the time I did put into exercise didn’t seem to do much for the areas I was wanting to target. Fortunately, a company has arrived in the Shenzhen that’s answering these issues by offering gym equipment that focuses on specific problematic areas while offering a light workout that doesn’t take an exaggerated amount of dedication. This company is HYPOXI and their Spa is located at the Grand Hyatt in Luohu. HYPOXI’s exercise equipment focuses on targeting stubborn fat deposits, reducing cellulite, tightening/toning the skin and improved complexion. When talking about stubborn fat deposits, fat burns more readily in areas where there is good circulation. This is why many people find it difficult to eliminate cellulite and fat in certain areas. A good test is to touch your skin around the legs, buttocks, hips, and stomach after a 30-minute exercise. The areas that are still hot have good circulation while the cold areas have very bad circulation. The cooler the surface of the skin – the less circulation it has. This is what makes the HYPOXI machines so effective. By using a unique technology known as the “HYPOXI-Method,” they are able to create a fat burning exercise that uses vacuum and compression therapy to maximize fat and cellulite loss in the right areas. The vacuum therapy used in HYPOXI stimulates targeted areas of the body through a unique combination of alternating pressure therapy and moderate fat burning activity. This saves you a lot of time and energy that would otherwise be spent on non-effective methods to lose fat and firm the skin. For example, one thirty-minute workout using the HYPOXI bike is equal to three workouts on a regular bike and targets the right areas. Because of this, the gyms and spas that supply the HYPOXI-Method offer an effective exercise as opposed to a hard workout and will give you faster results. 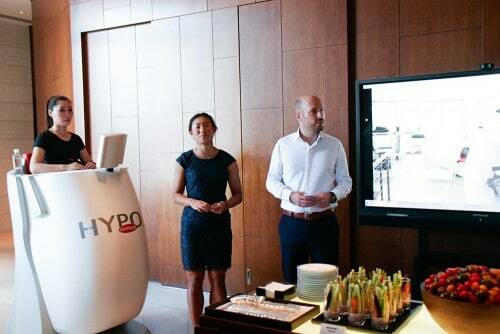 At the Grand Hyatt in Luohu, guests have the option to enjoy effective workouts using the HYPOXI-Method. My colleague and I were lucky enough to give this method a try on our last visit and fell in love with using this technology in our workout. The first machine used was the HYPOXI Trainer S120. This machine focuses on the lower body by providing a light workout of biking to help activate blood flow in your lower body area. During this exercise, the lower half of your body is enclosed in a tight vacuum alternating pressure chamber. This pressurizes the right areas while you are working out and helps to stimulate circulation in the problem areas. I could definitely feel the difference during the workout as my lower body became extremely hot. Also, I noticed the pressure around my stomach and waist would alternate and give those areas quite a workout while I was biking. After a session was over, I noticed the lower part of my body had sweated a lot more than the upper part and could feel like I just did a rigorous workout – even though that was definitely not the case. Later on, I went to the gym wearing the HYPOXI Vacunaut. This suit targets pressure around the stomach and waist giving the result of a flat stomach without the use of sit-ups. It only takes a simple workout such as walking or jogging and really enhances the experience by providing alternating high and low pressure to the stomach; thus, giving more than just a cardio exercise. Trying this out, I could definitely feel the pressure and knew that it was doing its job well. After only half a session, I was definitely feeling the heat as the pressure suit applied pressure to my waist and stomach area. This made a workout that usually would be simple for me quite difficult and it showed in the amount of sweat that my body was producing while just doing a light jog. If you are looking at losing fat in the stomach or hip region, you definitely need to give this technology a try. My college Wendy gave the HYPOXI Dermology a try and loved the therapeutic feeling it gave. In order to remain elastic and smooth your skin also needs to be exercised. This technology does just that by using integrated chambers within a pressure suit (HD-Pressure Suit) to apply high and low pressure to the skin around problem areas. There are many bubble-like indentions in this suit that seem to massage you while the low and high pressure circulates. This gently stretches and compresses the skin tissue in a similar way that muscles are trained. Wendy loved the feeling and found it to be very relaxing. It’s comforting to know that you can reduce cellulite and enhance your complexion in just a relaxing twenty-minute session. Shenzhen is lucky to have an HYPOXI Spa located at the Grand Hyatt Hotel in Luohu. Here an extensively trained HYPOXI coach who all has a wealth of knowledge in fields such as sports training and nutrition will closely supervise you. 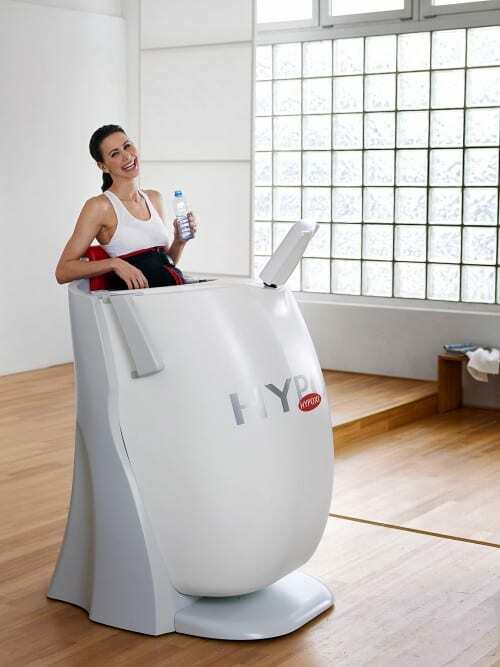 With HYPOXI, only two to three short sessions per week are more than enough to have fast visible results. Currently, at the Grand Hyatt there is a special opening price with 30% off the regular rate of HYPOXI Spa treatments.